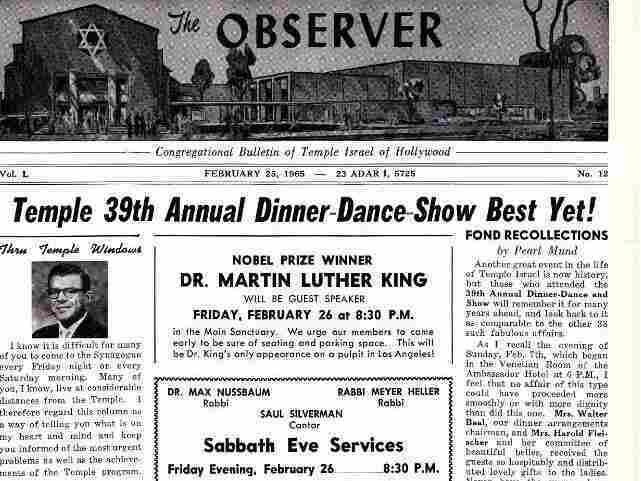 In Hollywood, MLK Delivered A Lesser-Known Speech That Resonates Today Fifty years ago, Martin Luther King Jr. visited Los Angeles and spoke to a standing room-only crowd at Temple Israel. The synagogue honors his legacy by replaying the speech once a year. 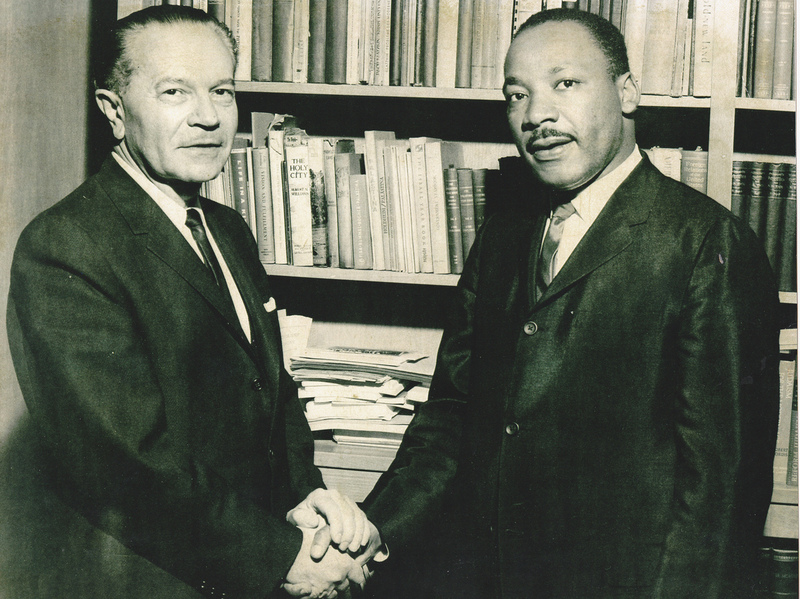 Rabbi Max Nussbaum (left) and Dr. Martin Luther King Jr. in Los Angeles. Shortly after winning the Nobel Peace Prize and coming back from Selma, Ala., where residents were protesting discrimination and repeated police brutality, the Rev. Martin Luther King Jr. delivered a lesser-known speech to a full house at the Temple Israel of Hollywood in Los Angeles in 1965. The Temple Israel of Hollywood bulletin from February 1965 announcing Martin Luther King Jr.'s visit. Formally dressed in his dark minister's robes, he told the 1,400 people assembled how much their support meant to those in the thick of the struggle. "We are often given new courage and vigor to carry on when we know that there are friends of good will in the background who are supporting us — and we feel this, day in and day out," he told the congregation. Initially, King had been scheduled to speak at the temple 20 months earlier, but President John F. Kennedy's assassination postponed that event. This night, mere days after Malcolm X had been assassinated, and days before civil rights activists would march in Selma to demand voting rights, King finally was in Los Angeles. He sat between Rabbi Max Nussbaum and philanthropist Bruce Corwin's father, who was the president of the synagogue. The soaring sanctuary looked then much as it does today. Its velvet-covered chairs face a podium dominated by the temple's ark, which holds a Torah rescued from a Berlin temple as it was being torched by the Nazis. Corwin, a Temple Israel member since birth, was a college student in 1965 and remembers the evening vividly. "His voice — he modulated his voice so magnificently," he says. "It was just thrilling to hear how he — the highs and the lows of the way he handled his voice." That night, King spoke about many things, including income inequality abroad and at home. "There are some 40 — between 40 and 50 — million of our brothers and sisters in this country who are poverty-stricken," King told them. "There they find themselves perishing on a lonely island of poverty in the midst of a vast ocean of material prosperity. Certainly, if we are to be a great nation, we must solve this problem." King so impressed his audience, Corwin says, that collectively, they donated the largest contribution ever gathered at a Sabbath service. His 1965 visit came at a time of rising racial tension, and the same is true today. But the temple plays King's speech every year, Corwin says, and his words are a reminder that the struggle for justice is ongoing — and that the effort is worthwhile. "History has a way of repeating itself — I mean, look at Ferguson, look at New York, look at what's going on," he says. "And we've come a long way, and yet have a long way to go."